Note: This article will have some light spoilers, so please don't read on if such things matter to you. I’m about 20 hours into Mass Effect: Andromeda now, and while that’s not far enough to form definitive opinions on the game (hence this is not a review), it is enough to have a grasp of the game’s fundamental ideologies and themes. With that in mind I can say this; unless there are some absolutely massive revelations coming up, Mass Effect’s animation and presentation quality, which is where so much of the game’s criticism is, is the least significant of its problems. Related reading: For an example of just how deep Mass Effect's originally trilogy was, here's one way to interpret the events of the games, where the Reapers are not the "Evil" ones. Based on what I’ve experienced so far; the real problem of the game is that it aggressively promotes the same kind of horrible ideology of stuff like Ghost Recon Wildlands. 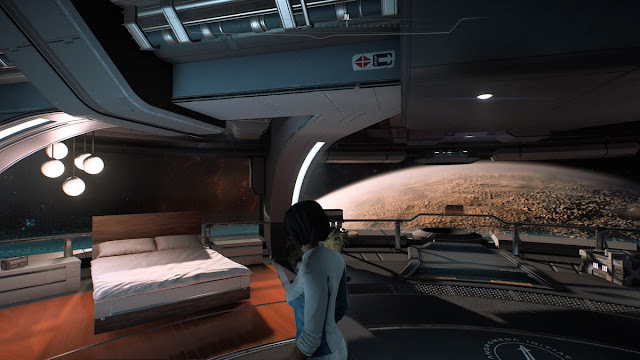 We were promised in the lead up to the game’s release that Mass Effect Andromeda would look at the idea that “humans are the aliens,” and based on the previous trilogy, many of us thought that the game would therefore create a discussion about colonial and imperialism, and work through the various moral and ethical conflicts associated with such things. But, nope. Again, short of some really startling revelations later on in the game, what Mass Effect does instead is assume that humans, by virtue of being human, have every right to take whatever they like from Andromeda, and the natives are required to capitulate or be subservient to the humans in this, else the humans have the moral authority to destroy them. In the sequence that behaves as the tutorial, humans come across the alien Kett for the first time. These Kett are aggressive and shoot at the humans first, and so the humans fire back. Okay, fine. Self defence is also a moral defence. But the good news is that the characters go as far as to reflect on their actions in firing back. Ryder, the character you play as, even goes as far as to say to one of her squad-mates “if armed aliens showed up on earth, how would you respond?” Okay, this is a fine start. But then the real game starts. The humans make first contact with a friendly alien species, and then immediately start making demands of them. One of the aliens, Jaal, joins the crew, but is immediately treated with hostility and the crew need to have a debate about whether to include his input into the mission at all. The aliens are themselves locked in a deadly war with the Kett, but rather than provide support, the humans utter lines such as “the mission comes first.” And then the really bad stuff happens. These humans show up on an icy planet which is inhospitable to them, but are told time and again that those that live on the planet have adapted to its conditions. Rather than accept that the planet isn’t for humans, or Ryder then starts talking about how she is looking forward to activating ancient alien technology that would terraform the planet into something more tolerable for humans. There is no apparent concern for the mass extinction event that such complete climate change will cause on the non-sentient wildlife that exists on the planet. Indeed, there’s no apparent concern that there’s a sentient species using the planet themselves. The quest for habitation by the humans takes precedence. This is how humans have historically behaved when exploring, of course. Be it Africa, the Americas or Australia, the Europeans turned up, pushed the natives out of the way, and went about building their cities and taking advantage of the choice bits of land. Any that resisted were treated mercilessly. In theory we’ve since generally come to the realisation that colonialism caused all kinds of problems for these places, many of which are still, to this day, trying to stabilise after finally winning independence in the last few decades or centuries. But there is nonetheless a continued belief that westerners have a right to simply take. Mass Effect’s narrative simply does not seem to care about what happens to any other species in Andromeda. Worse is the way the game attempts to justify the human’s behaviour. As we discover (the main spoilers in the article ahead) the Kett are big on what effectively amounts to eugenics, and are using the same alien technology that the humans are in order to take the “good” parts of other species to use them for their own purposes, and to create more Kett. This means that the natives of Andromeda are given two horrible choices, and no actual choice; their habitats are terraformed into something that will likely kill most of them… or they’re killed anyway. There are a couple of alien species’ that we know are as adaptable as humans, and that seems to be the yardstick to which Mass Effect believes that a species has a right to live; on its adaptability to what humans are doing to its planet. It might be “justified” in the sense that eugenics is something worth fighting against, and certainly the game makes it clear that humans have a right to seek a new home, but make no mistake about it; this is colonialism without critique. More than the game’s animation, which I’ve more-or-less learned to ignore, this apathy towards the moral questions around what the humans are doing has been both surprising and distracting from my time with Andromeda. 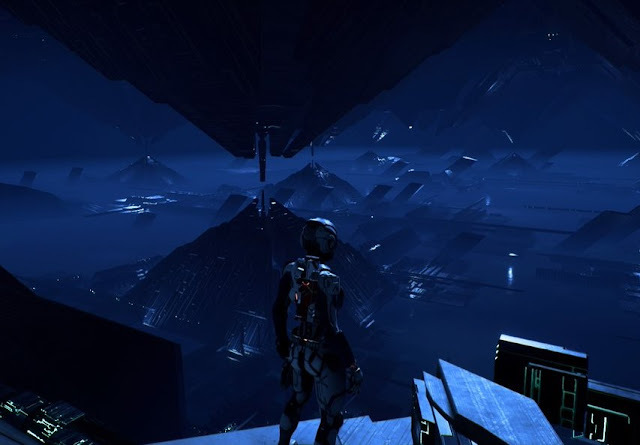 The previous Mass Effect trilogy certainly didn’t shy away from the big questions; ultimately making a solid argument that the game’s enemies, the Reapers, and the perfect existentialist threat that they represented, were justified in what they were doing, and humans in fighting back were quite possibly doing the wrong thing. There’s very little in Andromeda that genuinely questions the behaviour of the humans, much less the existential threat that they themselves pose to a lot of stuff in the Andromeda galaxy. That’s not to suggest that Mass Effect Andromeda doesn’t feature moral questions, because it does. They’re just incredibly insular. For example; early on Ryder investigates the death of one of the settlers, which has been determined to be murder, but the convicted insists that he’s innocent. On investigating what happened Ryder is able to determine that the victim was indeed shot and killed by Kett, but the accused murderer had also intended on killing the victim. Ryder needs to decide whether to allow the conviction of the accused stand, or overturn it. This is certainly a moral question worth pondering, and it’s a vintage “difficult decision” that BioWare is so renowned for giving us. 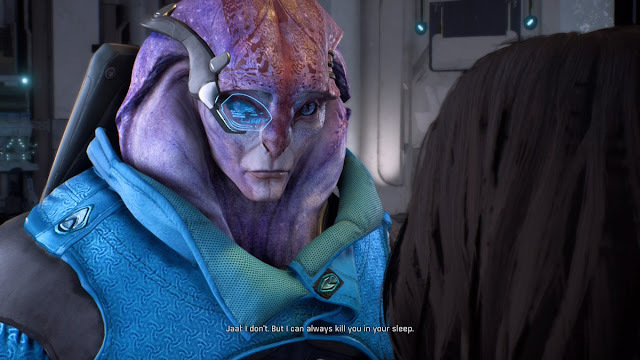 But, in the context of the macro actions that humans are taking in “their” new galaxy, and the game’s general apathy towards those moral questions, side stories such as this feel insincere and tokenistic; more an attempt to appease the BioWare fans that like thinking over moral questions, than a core concern of the narrative design team. Just like I rapidly lost interest in Ghost Recon Wildlands because I found the justifications being given to the players for doing the terrible things that they get up to in that game to be flimsy at best, so too am I genuinely contemplating giving up on Mass Effect. It might be that the final act turns things around, but I’ve asked people far further into the game, and based on what they’ve been telling me, it doesn’t really get any less superficial in how it handles the reality that humans are invaders, and taking over planets in the most hostile of manner. The game continues to be a broad defence of colonialism. It’s more disappointing coming from BioWare than the other AAA-developers out there, because BioWare is meant to be the progressive one. For the same developer that has done such good for the industry in fostering representation for both ethnicity and sexuality to about face and build its game around such something so regressive as colonialism has been a sharp reminder that the games industry still has quite some ways to go before in addressing a number of important social, cultural, and historic debates. Worryingly, there aren’t many critics exploring this theme in the game themselves at the moment. Everyone seems to be so fixated on superficial elements, like the animation, that the really important conversations that we should be having about Mass Effect: Andromeda, are being silenced or sidelined.